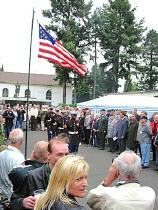 Every year there is a 4th of July celebration at the former compound of McNair-Barracks. The members of "McNair-Museum" made this possible. In their free time, after work, they put a lot of work into this project, to keep the memories of the soldiers and civilians working for the Berlin-Brigade of the U.S. Army in Berlin. Here on the photos you can see the people which joined the celebrations. In the year 2003 I also visited the exhibition "Alliierte in Berlin" which is located at Tegel airport. Visitors today: 4 - Total: 26055.